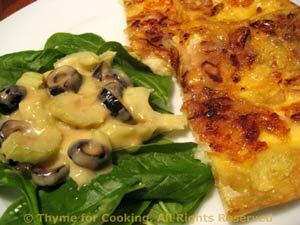 Cheese Pancake with Spinach Salad, Thyme for Cooking first course. This is a cheese dish, not an egg dish, although at first glance it resembles a frittata. Cheese pancake: Peel shallots and thinly slice. Heat oil in a small, nonstick skillet or omelet pan. Add shallots and sauté over medium heat until well-cooked and browned. Slice cheese and lay evenly on shallots. Put egg into a small bowl and whisk well. Pour over cheese and let cook over low heat, undisturbed for 15 minutes. Cook other side until brown, about 5 minutes longer. When done, slide onto a plate, cut in half and serve, spinach salad on the side. Spinach salad: Prepare spinach, wash and pat dry if needed. In a small bowl, whisk mustard, vinegar and olive oil. Stir in celery and olives. Arrange spinach on plates, spoon dressing on top.